This time around it's a baby boy. He's due November 26th. 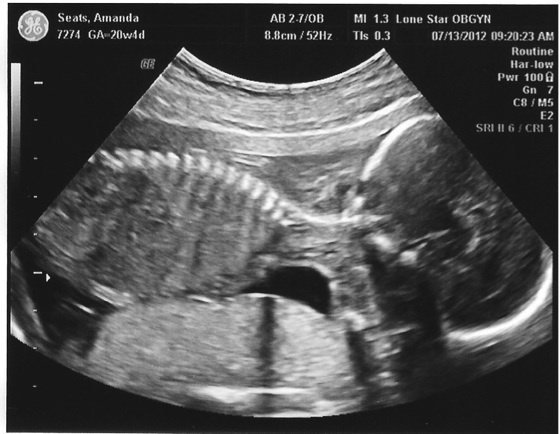 While I didn't experience the extreme stomach-flu-like nausea this time around, 1st trimester was still a doozy. 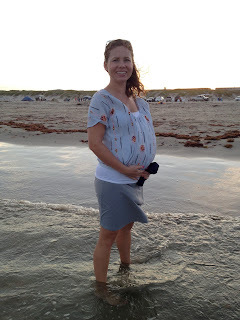 The hallmark of this pregnancy is a mild yucky-tummy feeling that I have most days, still, while well into my second trimester. Fool me once, shame on you, fool me twice... well... I get a baby boy? Here's me with baby boy half way cooked at 20 weeks. After 3 years of living in Texas, we finally made a trip to the Texas coast- Port Aransas. I wish we'd gone sooner! Just 3 hours drive and we had everything we needed- sun, fun, and sand. So, we camped out on the beach for a few days, and our friends joined us for the weekend. Isla loved playing in the ocean and the sand. Weeks later, she still suggests most days that we should visit the ocean again. 4th of July at friends' house in Portland, TX. Isla is a fearless water baby. She did the water slide over and over, until she just was too tired to go again. The Texas beach has seaweed, but the warm ocean water is so nice. We have reached a new milestone in parenting- Potty Training. 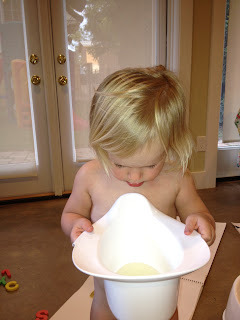 Isla seemed ready to potty train with increasing awareness of wet and dirty diapers during the spring. 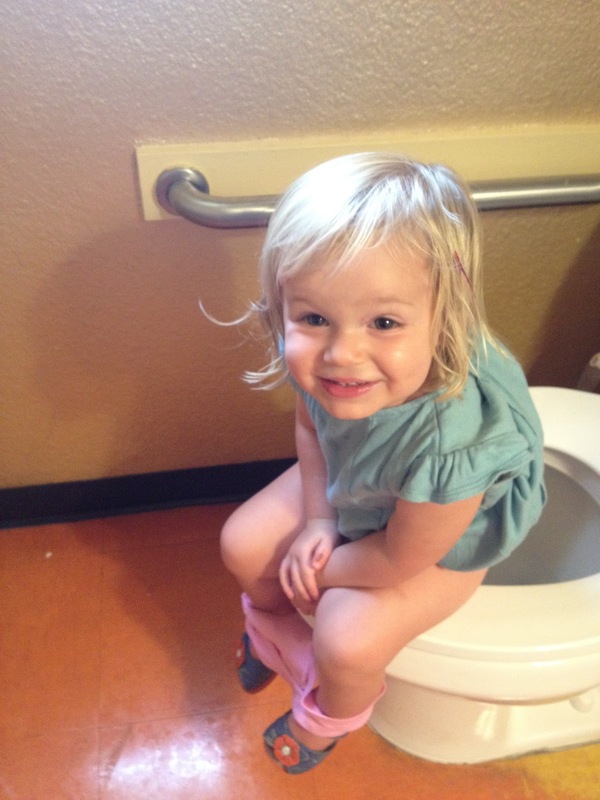 But she never had an "accidental" success on the potty. So, Jason and I both read from cover to cover "Toilet Training in Less than A Day" by Azrin. This book was written in the 70's and has some funny out of date rhetoric. One Saturday, after my dear husband kissed me on the forehead, and wished me good luck, he was off, and I was left to potty train with Isla, in less than a day. Isla quickly grew tired of the teaching the "baby that pees" how to go potty. Soon after that, she refused to eat or drink any of the special juices, snacks, and treats that were a part of the training process. She continued to wet her new underwear several times throughout the morning. And I had vertigo from standing up and sitting down on the floor so many times. So, I gave it a rest. Jason came home and gave it a try, and had the same result. I spend the rest of the day in bed. Sunday we tried again. Still no success, nothing in the potty. Later that evening, I took that little girl out to the Carriage House, with it's cement floor, and played with her naked on the bottom for 2 hours. All the while keeping a watchful eye on her little girl parts, until I noticed a sprinkle on the floor. I quickly sat her on her pot, and she did it! We spent the following week, whenever at home, with Isla commando and she had many more successes in the potty. But she could not keep her undies dry. Along came weekend #2, and she finally put it all together and got better at keeping her underwear dry. So, we began to leave the house in underwears. So far, as long as I get her on the potty frequently when we are out, she's doing great. At home, she goes on her own. She is so cute and proud of herself and her new skills. She tells me every day, "Isla's not a baby, she's a big girl." There's a lot of potty talk going on at our house. Here's Isla talking about Rhino Poop at the zoo.